Located in Midtown Manhattan, within walking distance to the Theatre District and Central Park, Etrusca Mediterranean Bistro offers New York City visitors and New Yorkers alike the taste of authentic Mediterranean cuisine by Chef Richard Brown. 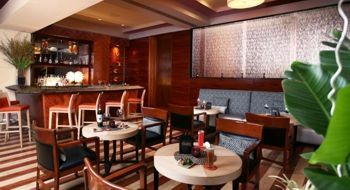 The restaurant is accessible from the main entrance on 53rd Street between 6th and 7th Avenues or through the Hilton New York main Lobby. Open every evening. Patrons unwind in the Bar Room for the cocktail hour, enjoy the prix-fix three-course pre-theatre dinner menu or a full Mediterranean inspired menu in a convivial space. The menu consists of hand-made pastas and risottos, succulent meats, fresh seafood and the freshest local produce from Long Island and Upstate New York.